Resuming the ” Islamic state Briefing”, this week with part four. The depth of the jihadist movement ranges back to the 1980s and ISIS has its history since the 2000s. The study of the Jihadist movement has tried to understand it in terms of street criminals, gangsters, individuals obsessed with computer games (particularly first person shooters), and a desire to go from zero-to-hero. It hardly addresses foreign fighters from Arab countries and often lack any attempt to address the theological aspects of the movement, imagery, encoded messages and prominence of scholars within the Jihadist movement’s overall interpretation of theological concepts, including an Islamic State model of governance. Reducing the Sunni extremist cosmos by only focusing on the “Islamic State” after 2013 at best, referring to them as “jihadists” while not even considering the history of IS since the very beginning in the 2000s, leads to a marginal understanding of the group and the motivations behind it. Neglecting the massive quantity of high quality Arabic language writings by ISIS and the Sunni extremist cosmos it stems from is a disaster. Core concepts such as tawhid or shirk are widely unknown and only briefly explained at best. What is missing is a discourse based on thorough, evidence based facts. However, these facts cannot weigh into discourse or echo within academic research, when Arabic sources and the theological universe that drives Sunni extremists remain neglected. Without proper Arabic skills and with no deep-rooted research on Islamic theology, the Sunni extremist movements remains hidden behind a firewall. Without knowing this content by heart and being able to decipher visual codes, uncovering extremist networks online is a challenge and has led to the assumption there is a decline of ISIS media production. This is the case, if researchers only look at superficial English language content on Twitter and do not see the rich blend of materials that are published in Arabic – and since early 2016 to a great extent on Telegram. Ignoring the huge library of writing by focusing on only the narrow daily announcements, or English language material, leads to dangerous misinterpretations of the movement – even more so, when not even Latinized Arabic key words in English language propaganda releases are questioned or taken into consideration. Facing the contemporary challenge of the Jihadist movement, policy cannot afford to fall for superficial interpretations, which emphasize memes, general simplifications, infographics, and flashy videos – and generally ignore the deep theological nuanced Arabic publications. The movement is significantly more complex than these interpretations suggest. The ideology that is based on theological concepts and framings of al-Qa’ida (AQ) and subsequently the splinter group the Islamic State (ISIS) and its ability to propagate this theological spectrum as a monopoly of truth through professional promotion and marketing material disseminated via modern communication technology has proven to be its most resilient foundation and greatest innovation. 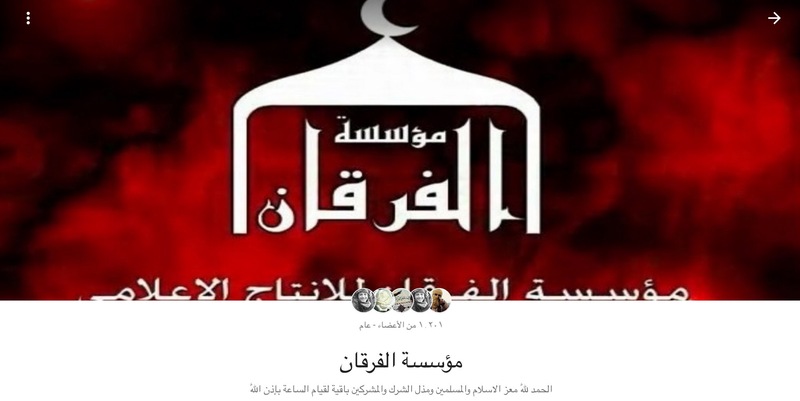 This Jihadist media activism is evident and strengthens this resilience on a daily basis with new audio-visual and written propaganda uploaded from a number of conflict zones, in numerous languages, to a wide range of online social platforms and multimedia channels. Policy makers in the U.S. and the E.U. lack a thorough understanding – for jihadist narratives that are widely based on religious scripture, advocating a cohesive and coherent ideology, that is, to be precise, theology. This theology is based on complex religious principals, offered mainly in Arabic and has its basis in the 1980s to contemporary al-Qa’ida ideologues, whereas ISIS in particular displays the implementation thereof in oftentimes easy to comprehend audio-visual productions. The Sunni extremist writings and videos from back in the 1980s to today refer and cite not only religious scripture, selected ayyat from the Qur’an and hadith – deeds and sayings ascribed to Prophet Muhammad – but also cite and reference historical Sunni Islamic scholars such as Ibn Taymiyya, Muhammad ibn ‘Abd al-Wahhab, Ibn al-Qayyim or Ibn Nahhas, to name a few. This is part of the textual layer that is being pushed out on all channels on the Internet. Historical scholars – overwhelmingly having written in Arabic – are often quoted “who says there is no distinction to be made between combatants and non-combatants. A Wahhabi scholar from the 19th/20th century is quoted saying that in principle killing unbelievers is allowed. This is another proof for the family resemblance between Wahhabism and Jihadism, easily substantiated by the number of theological tracts republished by IS”, as noted by Rüdiger Lohlker in reference to the Barcelona attacks. Without Arabic and the proper command of knowing who such historical scholars are and under which circumstances their theological treatises were penned and why this matters today and how this is used by online media savvy activists, most documents and videos by jihadists remain a safe haven. Not to mention the general lack of understanding the scope, pace and depth ISIS has on Telegram, whereas most studies of 2017 solely focus on Twitter, claiming twitter remains the entry point and primary dissemination hub for ISIS. Community building takes place on Telegram and twitter is used for media raids – while the content varies between Arabic theological support materials and core graphic materials. Researchers need to focus on both while understanding and the ecosystem and where it all stems from. The daily content is just the tip of the iceberg. The archive of Sunni extremism represents what the movement is about, lays out the strategy, and justification for actions. Alone ISIS released over 2,000 official videos and much more daily short clips; all in all, from the 1980s to today, over half a million – mainly Arabic – documents exist in digital format, whereas materials before the age of mass digitalization have been digitalized by the first generation of committed electronic media mujahidin in the 2000s. 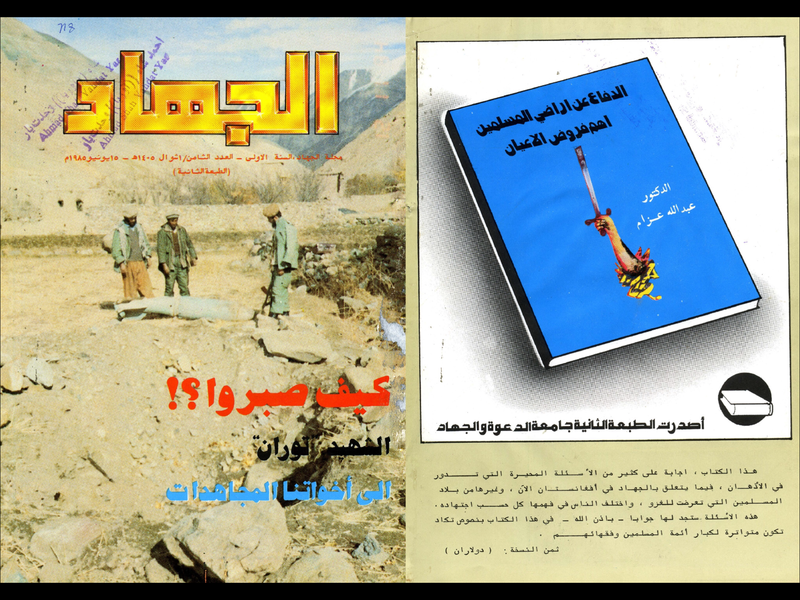 116 editions of the Arabic language magazine “al-Jihad” were printed and disseminated from 1984-1995, focusing on Afghanistan, Palestine and later the Balkans. The first generation of al-Qa’ida on the Arab Peninsula (AQAP) pioneered the electronic frontier of jihad by releasing two magazines, “The Voice of Jihad” (in sum over 1,500 pages) and “The Military Camp of the Sword.” Nothing about ISIS as of 2017 is new, if such magazines have been read and taken into account when studying jihadism. The cover of the al-Jihad magazine of June 1985 addresses “our sisters, the Mujahidat”, women who fought alongside males in the war against the Soviet occupation. More telling, however, is the advertisement for ‘Abdallah ‘Azzam’s book “The Defense of Muslim Lands is the Among the Most Important of an Individual’s Duties”. ‘Abdallah ‘Azzam was a Islamic scholar (shaykh) from Palestine and had been a university lecturer for Islamic jurisprudence (fiqh) in Amman, Jordan. In 1989, he and his two eldest sons Muhammad and Ibrahim were killed in a car bomb in Peshawar, Pakistan. ‘Azzam is until now, decades after he died, one of the most influential theologians, who is being regularly cited, referenced and eulogized by all outlets of jihadist media capacity. In 1988, ‘Azzam travelled to Seattle, USA, and gave a khutba, the Friday prayer. This khutba was filmed and that video is part of the Sunni extremist ecosystem. While he was in Seattle, the conflict in Afghanistan was slowly but surely coming to an end. Dominated by the events of the jihad against the Soviet Red Army, ‘Azzam not only tries to recruit and ‘re-introduce’ Islam to his audience of America-based Muslims but he moves a step ahead and attacks the United States as another major, logical future enemy at a second or third stage of jihad with the victory in Afghanistan in sight for the Mujahideen. ‘Azzam’s khutba provides a usual mix of citations from the Qur’an and sunna, bound to his contemporary tales of the fighting Mujahidin as well as the suffering Muslim population in Afghanistan. While he also includes stories and details of individual Mujahidin who fought and died, who attained the “shahada on the path of God” (i.e. died as ‘martyrs’) and witnessed divine blessings during their service for God, ‘Azzam repeatedly addresses the need to “establish an Islamic state” that can only be realized by jihad, combat (qital) with the potential to enter Paradise (janna) while struggling for this divine aim. ‘Azzam, who was a highly industrious writer and who frequently gave sermons, introduced stories from the Afghan jihad and tales of the shuhada’, killed Mujahideen who as a result attained the shahada for the sake of religion, and has made such stories from the frontlines of jihad popular, accessible and perhaps somewhat mainstream. 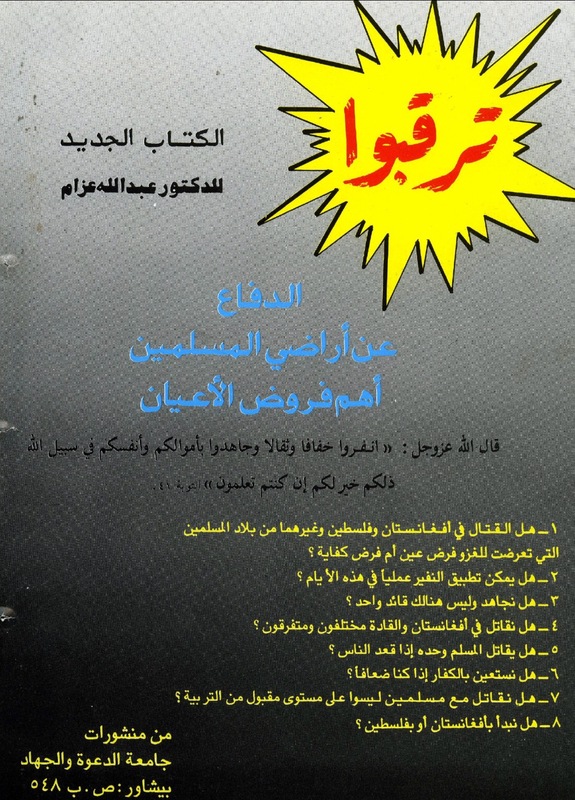 One of his documents, the 251 page long writing entitled “The Craving for the Women of Paradise” (al-hur), can be considered as a template for contemporary jihadist publications (writings and videos) regarding the shuhada’, glorifying jihad and providing the theological and historical necessity to do so. And the questions of Muslim unity and disbeliever aggression, etc. all of these elements matter for jihadism and since the Syrian revolution turned extremely bloody and was hijacked by seasoned jihadist fighters and clerics, these elements are of essential value to understand the mess in the Middle East (and attacks/operations elsewhere; besides Europe there are The Philippines, Indonesia, various attacks in Russia, Maldives etc.). This is just one example of the tradition of Sunni extremist content – online &offline – that forms the basis of materials published by the “Islamic State” as of 2017. Including, materials that are available online and are also handed out within ISIS territories, as has been documented since 2013 by the very media cycle of ISIS. This ecosystem contains the answers to questions posed by those who only read the daily updates. For example, the archive of the Jihadist movement contains the rationale stretching back to fighting with the Soviets in Afghanistan for when female suicide bombers are permitted and when they are not, it is no mystery when research takes in the archive of Arabic documents. The documents and videos produced by Islamic State project what they consider to be a real Sunni Muslim, on the path of God who acts in accordance with divine rule and regulations which the early Muslims had under the leadership of Prophet Muhammad. Any release by IS – as much as by AQ – seeks to inform, educate and convince the consumer that the jihadis are the only “true” Muslims, following the correct “prophetic methodology” This ideational content echoes an earlier prediction about an internet-enabled ideological struggle over the definition of reality. In this vision, warfare would be “conducted on an entirely new battleground; it is a struggle not over territory or boundaries but over the very definitions of these terms” where IS seeks to maintain hegemony over concepts such as the “prophetic methodology” and other theological concepts expressed by key words. The battle for these definitions occur in the physical landscape and equally on the digital platforms that comprise the information ecosystem. Neglecting the evidence that jihadi networks online are both agile and unified around coherent theological “narratives”, risks breeding a sense of complacency, which allows the Islamic State (and other jihadi groups) to develop physical and digital locations to which they can retreat and regroup. This is a real risk if the current shift in distribution strategy adopted by the Islamic State is viewed as decline, rather than a reconfiguration and refocusing of effort. Yet acknowledging that the “decline” is based on faulty research, which neither takes the vast amount of Telegram communication into consideration or Arabic language materials (or Arabic words used in non-Arabic propaganda releases). Islamic State communicates its strategy to supporters predominantly in Arabic and oftentimes uses citations of legitimate mainly Arabic language scriptures, the Holy Qur’an and Hadith (deeds and sayings of Prophet Muhammad) as well as scholarly religious (historical and contemporary) writings. These citations of historical as well as contemporary Islamic scholars are frequent in writings and are woven into the audio-visual productions of jihadis. This cannon of material which jihadis have to hand justifies, from their perspective, their acts and seeks to provide a clear identity; of what being a “Sunni Muslim” means to them. Nico Prucha: Die Stimme des Dschihad – al-Qa’idas erstes Online Magazin, Dr. Kovac: Hamburg, 2010. Hegghammer, T. (2008) Abdullah Azzam, der Iman des Dschihad in Kepel, G. / Milelli, J. (2008) Al-Qaida – Texte des Terrors (München, Zürich: Piper), pp. 148-157. Hegghammer describes ‘Azzam’s academic development, his “religious studies in Damascus (1963-1966)”, his “Palestinian Jihad (1967-1970)”, his “promotion at the al-Azhar” University, Cairo, (1971-1973) and his “years in Amman (1973-1980)”. He become a professor in Jidda and was able to acquire a position in the Saudi funded new international Islamic University in Islamabad. He was killed on Friday, 24.11.1989 at about seven o’clock in the morning, on his way to a mosque in Peshawar to preach the Friday sermon. Muhammad was 20 and his brother 15 years old (Hegghammer). Various conspiracy theories exist, who killed ‘Azzam (Hegghammer, pp. 163-164). Ranging from bin Laden who had him removed to gain control over the Arab fighters, to al-Zawahiri, who wanted the Egyptians in charge and who wanted to attack the regimes in the Middle East while ‘Azzam vowed for the Mujahideen to remain in Afghanistan to found a true Islamic state. Or was it a personal revenge, committed by an Afghan splinter group or was it the ISI? The double-agent Abu Dujana al-Khurasani, aka Humam Khalil Abu-Mulal al-Balawi, who on 30 December 2009 killed several CIA and Jordanian GID agents in Khost, Afghanistan, by undertaking a suicide-operation claimed in one of “last interviews” also to have revenged ‘Abdallah ‘Azzam. According to al-Balawi, the GID is responsible for his murder. Prucha, N. (2010) Notes on the Jihadists’ Motivation for Suicide-Operations, Journal for Intelligence, Propaganda and Security Studies, 4 (1), pp. 65. ‘Azzam, ‘A. (1987) Ilhaq bi-l-qafila, http://tawhed.ws/r?i=6nxrvref (25.10.2010). “Join the Caravan” is a classical work of the jihad literature. ‘Azzam, ‘A. ‘Ushshaq al-Hur, http://tawhed.ws/dl?i=pwtico4g (02.10.2010). “The ‘Abdallah ‘Azzam folder” can be accessed here: http://tawhed.ws/a?a=a82qriko. Douglas Rushkoff, Cyberia: Life in the Trenches of Hyperspace, Harpercollins Publishers (reprint): New York, 1995. Among the tens of thousands of writings are prominent items such as “An Abbreviated Biography of the Prophet – Peace and Blessings upon him” by ISIS media foundation Maktabat al-Himma (2015, 335 pages) or the 1106 page long theological tractate by Khalid bin ‘Ali al-Mardi on shirk – ascribing or the establishment of “partners” placed beside God, which is a frequent theological sanctioning used to execute “apostates” and Shiites within ISIS videos.